Redzel and Kerrin McEvoy have done it again. 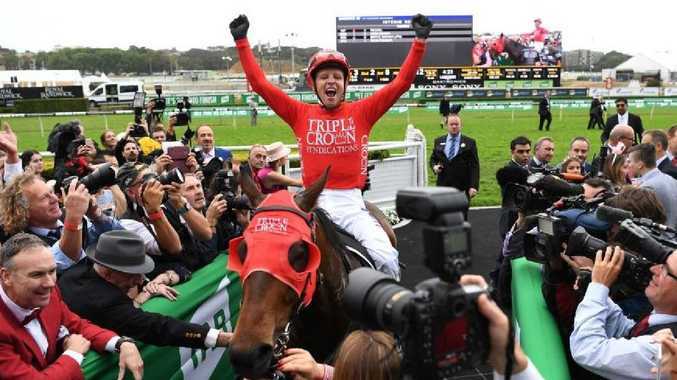 REDZEL has defended his inaugural Everest crown in winning Saturday's $13 million international feature, leading from start to finish in front of a huge crowd at Royal Randwick. Ridden again by Kerrin McEvoy, the Peter and Paul Snowden-trained gelding took full advantage of his inside draw to quickly set the tempo of the race, kicking clear over the rise to establish a commanding lead on his rivals. Redzel's share of the prizemoney was $6 million, taking his carer earnings to close on $15 million. "It was a masterful ride and Kerrin judged it perfectly,'' co-trainer Peter Snowden said. Redzel was never seriously challenged at any stage of the race, safely holding off a brave Trapeze Artist, who had beaten him in the TJ Smith by two lengths when they met in the autumn over the Everest journey of 1200m. Godolphin outsider and Everest emergency Osborne Bulls ran the race of his life finishing almost on the outside rail to just grab third placing. Le Romain was a close fourth. Favourite Shoals was unplaced as was high class UK raider US Navy Flag, who never seemed comfortable on the heavy track. A lazy $600,000 entry fee for each horse was put forward before the 1200m race, with Shoals - starting from barrier two - sitting as the $5 favourite at the gate. Defending victor Redzel, who was last week named Australia's champion sprinter for 2017-18, came in at $8. Debate had raged in the lead-up to the world's richest race over a controversial plan to project the barrier draw onto the famous sails of the Sydney Opera House. Thousands of Sydneysiders protested the plan and while the outrage was widespread, it drew a global audience to the spectacle that it The Everest.